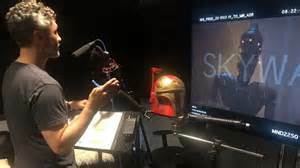 Beloved director Taiki Waititi (What We Do In the Shadows, Thor: Ragnarok) had already been announced as helming an episode of the upcoming The Mandalorian on Disney+, the studio’s streaming service. It appears he will do more, voicing a droid in the series. Show creator Jon Favreau shared an Instagram post of Waititi in the recording studio, with an image of the droid IG-88 visible on the screen in front of him. One of the most lethal bounty hunters in the galaxy, IG-88 is a rogue assassin droid who first appeared in The Empire Strikes Back. But he hasn’t had a voice in any of the live-action stories so far. The first live-action TV series set in the Star Wars universe, The Mandalorian takes place after the fall of the Empire and before the emergence of the First Order, following the travails of a lone gunfighter in the outer reaches of the galaxy far from the authority of the New Republic. More details about the series are set to be revealed on April 14th at Star Wars Celebration in Chicago.